Today, it seems like everyone wants to go viral. I constantly see Facebook updates saying “help this post go viral”, or YouTube videos asking people to share the video to make it go viral. We get it, everyone wants to go viral. Virality can skyrocket your following, likes, recognition and if you have a business, sales as well. We’ve seen people completely unknown to the world one day, become a world-known celebrity the other. Usually for completely mind blowing reasons. You’ve probably seen people like “Damn Daniel” and “Catch me outside, how about that?” become viral success stories in a short period of time, and get all sorts of special deals and offers such as Ellen features or The tonight’s show. If you’re wondering, yes, your business can go viral too! And it can boost your brand in a way you’ve never witnessed before. Going viral is difficult but not impossible. Therefore, in this article, I thought I’ take the opportunity to discuss how you can increase the chances, and work towards going viral on social media. It may seem obvious, but social sharing is the fuel to viral content. The beauty with shares is that once it gathers some traction, it won’t take too long before your content is seen all over the world. Now, today, this isn’t the case, but just imagine if everyone who saw your post would share it. 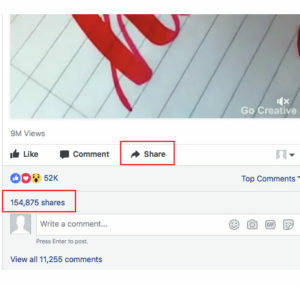 One share leads to all the sharer’s friends sharing the post, all the sharer’s sharer’s sharing friends share the content, which will lead to the post quickly spreading like a virus. (Try saying that 5 times quickly). Within a few steps, you’d quickly be shared by the millions. While it doesn’t work like that, virality can be reached even if only a small portion of the people who sees the post shares it. That’s the beauty of social media. While many people are over-sharers (and you´ve probably blocked them from your news feed for that very reason! ), in general people share for two reasons: to entertain their friends, or because they recognize themselves in the content they share. The type of content I see being shared often on Facebook is just that type of content, and this can be seen in the comment section if you take a minute to study it. A common scenario is a “Fail video” of someone falling or committing any type of mistake. In the caption of that video is often a “Tag a friend who does this” call to action. What do you think people do? 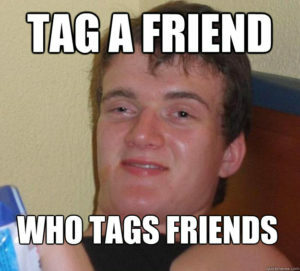 They tag their friends of course! In these types of videos, you can see comments like “haha that’s typically me “This was me last spring break”, and so on. Because people can relate to them! By creating content that people are more likely to share, you make it shareable. You don’t need to insert share buttons here and edit your caption there. Most often, all it takes is to share content that provides value. Whatever you do, make sure whatever you are trying to make go viral, make sure it provides value and makes the viewer feel like they are getting something from it. Because only that type of content will be shared by people, and only content that provides the viewer value will go viral. No matter what type of content you share – and this goes for anything in life, it has to provide value in order to be worthwhile for people. We often hear the word “value” being thrown around in these contexts, but what does it really mean? Should you give the people who are sharing your content money? No, it’s a bit more complex than that. Value can be many different things. In short, it is something that makes the viewer feel like they got something from it and didn’t waste their time. Value can be anything from knowledge to entertainment, to information, to new connections. Something as simple as making your audience laugh is extremely valuable and can go a long way. In viral content, funny humor appeal to a large target market, and that’s also the reasons why a lot of the viral content you see is just that – humoristic. Controversial content tends to go viral a lot because it dares to stand out and be questioned. Now, this isn’t the strategy for everyone, because you have to be prepared to get hate and people who think differently from you. As a business, causing controversy may or may not work. For example, if you want your business to be portrayed in a positive light by everyone (as much as possible), controversy may not be for you, because by sharing controversal content, inevitably you’ll get “haters” and people who disagree. But again, if you agree with the quote “all publicity is good publicity” and want to be famous for stirring up emotions, controversial content might just be exactly what need. Strong engagement comes from personalization – talk about things that are personal to you and something they can relate to. Everyone loves to see “behind the scenes” of how something is running. For example what your real life is like. Adding imagery helps with the visualization. Whether it is a bad hair day or a real behind the scenes look, imagery is an amazing way to go viral. You can also share it across a range of social media channels too. 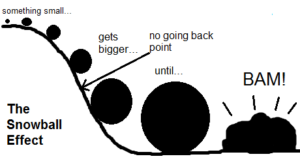 Going viral is like rolling a snowball down a hill. You can’t create a huge ball of snow that picks up speed and traction faster than a car if you don’t have any snow, to begin with. The phenomenon is called “The snow ball effect” and it symbolizes going viral spot on! Now, to get to the point of why posting time is so important, it’s all about creating a starting point. If you’ve tried to create a snow ball effect on your own, you know that if your snowball is too small from the beginning and don’t weigh enough, it won’t be able to pick up speed and grow larger. In order to have a chance of going viral, you first need to have a strong base of fans to start with. If you post at a time when your fans are most active, you increase the chances of them seeing your post, thus making the “snow ball” you start out with much more likely to succeed in gaining traction. The more people who see your post from the beginning, the bigger the chances are of you going viral. Now, we’ve spoken about the snowball effect and how it works like a foundation of a successful virality campaign. You now also know that in order to gain traction, you need to get a lot of people to see your post. And that’s just before your content goes viral. Thankfully, there’s a small hack that you can use that will increase your reach significantly, already from the start. I’m of course talking about influencers. influencers are trusted individuals in their industry who have built up large followings and a lot of trust. There are many ways you can partner with influencers, but when it comes to marketing your content with the goal of going viral, there are only two methods that are interesting for you to use. The first method is to get the influencer to share your content. Shares are more helpful on some platforms than on others. For example, Facebook, is the god of social shares, at the moment. They have an easy- to- use share button below all posts that any user can click on, in order to share it with their friends. And the good thing with Facebook is that usually, the users are not afraid to use it. Twitter also has a great sharing tool which means retweeting a tweet and sharing it with your followers. The second method is to use the influencer to increase awareness. This one is a little more trickier as there is no real definition of it, and different ways to use it. However no matter what it is you are doing, whether it is trying to increase sales, or going viral, awareness is always the first step. If you can get an influencer with a large following to share the content you are hoping to go viral, you’ll quickly be able to see your snowball pick up speed dramatically This is a huge help in getting viral attention and you will soon see your reach snowball if you get influencers with a large following to share your content. Now, this isn’t to say that it will go viral, it just means increasing your chances dramatically. If you have a budget for it, you can also pay influencers to share your content. In the Veloce Network influencer directory, you can filter through thousands of influencers in a matter of seconds based on your preferred criteria to reach your target audience. Advertising works big time or set up a cross promotion with other bloggers or well-known Instagram accounts. By cross promoting with someone who is targeting the same audience, you will get more bang for your buck. This is a great way To Make A Post Go Viral On Social Media.